When I lived in NYC I had about 10 favorite restaurants. A favorite casual Thai place, ampoule another for Tapas, physiotherapy the Ramen place, the sandwich place, the ever-delicious Babbo, and my favorite neighborhood place. I changed neighborhoods a few times, but when I was living in the East Village, that place was Lil’ Frankie’s. Lil’ Frankie’s was everything a neighborhood restaurant should be — dark, casual, consistently good, no reservations, reasonable prices and a great bar menu. The food is simple and satisfying with enough variety in the daily specials to keep it interesting. And as with any favorite place, I had a favorite dish. A mainstay that I’d order again and again…and again. The Spaghetti Limone. 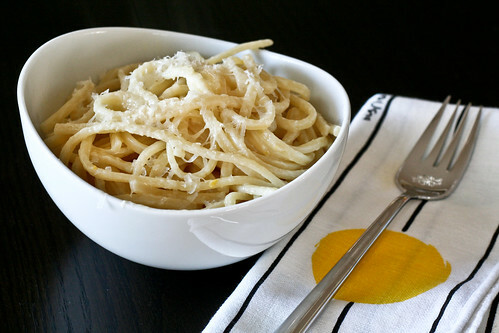 Simple spaghetti, tossed with a lemony, buttery sauce and topped with cheese. No garnishes, nothing fancy. Just plain delicious noodles. The simplest dish on the menu and my favorite. I’ve been trying to recreate it for a few years and this has been best imitation to date. Dear Frankie, if you’re out there, help a girl out and send me the real recipe! Oh, and a Norcini pizza while you’re at it. Please and thank you! I used Linguine because it was my best option at the store. Any thick, long pasta will work well here. We ate ours alongside a juicy rib-eye — a very, very delicious combination. It’s also great with a spicy homemade pizza. Drool! Set a large pot of water over high heat. Once it comes to a rolling boil, add a few tablespoons of salt. Since this is a simple dish, you want your pasta to stand out. Cooking it in unsalted water will result in a flat-tasting dish. Add the pasta and cook until almost al dente, testing it often to make sure you don’t overcook it. Drain. While the pasta is cooking, make the sauce. Melt the butter over medium in a large skillet, then stir in the zest. Cook for 5 minutes, then stir in the cream, white wine and salt. Reduce the heat to low and let simmer until your pasta is done. Toss the pasta into the skillet and use tongs to make sure the pasta is well-coated with sauce. Serve immediately and top with freshly ground cheese (to taste…I like at least a tablespoon!). Makes 4 entree-sized servings, or 6 side-sized servings. Love this because it’s so simple. So simple that you can taste each and every ingredient. Juicy rib-eye…yum. Looks delish! I have been meaning tomake a lemon-y pasta dish. Looks like you created a winner here! This looks gorgeous- so simple and elegant. oooooooo I made a lemon spaghetti this weekend, but it wasn’t a creamy version like this. This looks sinful! This looks perfect and simple. I love it and must try it soon. Lemons, butter, cream, and pasta…great combination. I absolutely adore the simple brilliance of this dish. Fantastic! I love how simple and elegant this dish sounds. I recently made lemon chicken, maybe lemon pasta would be overkill with the chicken, but I could see throwing in some peas and topping with simple grilled chicken for a nice pasta dinner. Love it! I mentioned your site on my blog today! This has become a staple in our house – so delicious and simple. Thanks for sharing! i tried this and it was amazing. I’ve never cooked such a subtle yet fragrant pasta before in my life. even without the grated cheese it was amazing! however, mine was a little bitter. do you think it was because i wasn’t careful enough with the pith? or because i cooked the zest for too long in the pan? should i add it a little later? steph – Thank you! I think the bitterness might have come from too much pith. Next time, try to cut the zest so that there’s as little white as possible, or use a zester. Like your stuff – as a kindred chicken spirit I will be back.